Winner of the British Jazz Awards "Best Trumpet of 2017," Freddie has cemented his place as a leading light on the British Jazz scene. With the release of his debut album "Transient" in April 2017, his star is certainly on the rise. He is a member of the Ronnie Scott’s Club Quintet and jazz-rock outfit Fletch’s Brew as well as being a band leader in his own right. A fearless improviser, "he solos with fluent authority, his tone ranging from the warmly conversational to the eloquently strident." 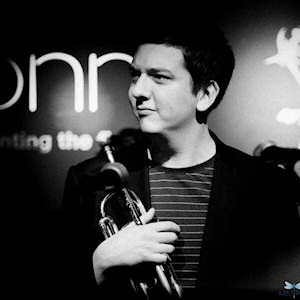 He has appeared as soloist with the BBC Big Band, twice at the BBC Proms at the Royal Albert Hall, and brought Roger Michell’s 2013 film "Le Week-end" to life with his inimitable muted trumpet stylings. Freddie has played with, among others, Peter Erskine, Joe Locke, John Hendricks, Kenny Wheeler, Stan Sulzmann, Tim Garland, Jon Faddis, Gregory Porter, Curtis Stigers, Paloma Faith, Jess Glynne, Seth McFarlane and Dionne Warwick. Freddie has composed and arranged extensively, including Alexander Stewart’s masterpiece "I Thought About You" and the stunning "Beloved" commissioned by Calum Au for his 2012 release "Something’s Coming." Watch Freddie play "Pull Your Socks Up"